The competition to be the next home for the military’s new air-refueling tanker got significantly stiffer this year, and supporters of Fairchild Air Force Base are all but crying foul that the rules were changed in the middle of the game. Instead of competing against one other base to be the next home for the KC-46A Pegasus, Fairchild is now among 11 bases that could be selected for what the Air Force calls Main Operating Base 4, or MOB4. The original competition in 2013 to be the first home for the new tankers required a facility that could accommodate 36 tankers, or three squadrons of the new planes. Not all Air Force bases could meet that standard; Fairchild, which once was home to more than 60 KC-135 tankers, easily could. It finished second to McConnell Air Force Base in that selection process. Earlier this year, however, the Air Force announced it would look at bases that can handle 24 new tankers, or two squadrons, for MOB4. The list of 11 bases is expected to be pared to between three and six sometime this summer, and a preferred alternative announced by the end of the year. The Air Force also suggested it would retire at least some KC-10s, a tanker that’s newer and larger than the KC-135, and use some of the new 46As it has ordered to replace them. Sen. Patty Murray, D-Wash., who helped shepherd the Pentagon’s request for the $46 billion tanker replacement program through Congress over more than a decade, said she can’t get a straight answer from the Air Force for either of those changes. 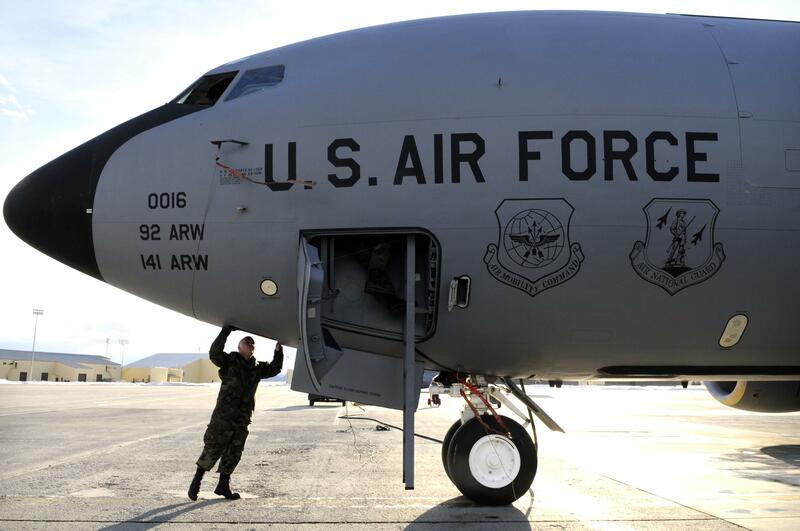 Rep. Cathy McMorris Rodgers, a Republican who represents Eastern Washington, agrees that Fairchild is the best choice for the next new tanker base and said the change in criteria raises questions for which the Air Force has only general answers. Ann Stefanek, an Air Force spokeswoman, said the current plans are to grow the total number of tankers to 479 from the current level of 455 with new KC-46A. After that, the new tankers coming off the line might be used to replace either the KC-135 or the KC-10. In the initial competition for the first KC-46A base, local officials and the state’s congressional delegation touted Fairchild’s size, existing infrastructure and position on the Pacific Rim as the United States shifted its focus to Asia. But it ultimately finished second to McConnell, near Wichita, Kansas, because that facility is closer to a base in Oklahoma where crews will train on the new plane and would cost less to remodel. The other bases on the 2013 short list ranked far lower in the environmental impact statement the Air Force prepared. If the criteria remained the same, local officials believed Fairchild would be at the top of the list for the next round of new tankers, which would be delivered around the end of this decade. They were shocked earlier this year when the preliminary list had 11 bases as possible homes and required less capacity. Earlier this month, Murray convinced the Senate Appropriations Committee to ask about the changed criteria in a way that would catch the Air Force’s attention – requiring the information in the budget for the nation’s military construction. MOB4 is the last base in the foreseeable future for an active-duty unit to operate the new KC-46A, a section attached to that appropriations bill says, and the Air Force’s suggestion for the base to have one less squadron would have long-term impacts on the operations of the entire fleet. “The KC-46A represents the future of the Air Force’s aerial refueling capability which is an integral component of all air operations for the Air Force and other services,” the section says. The change is so serious that the secretary of the Air Force should submit a report within 60 days of the bill’s passage that describes planning, risks, efficiencies and implications to the military’s overall strength, it says. The Air Force initially sought the new tankers to replace the KC-135, a plane designed in the 1950s on the same platform as the 707 jetliner and built through the mid-1960s. The Pentagon spent more than a decade on a process to select a replacement for that tanker plane before choosing a modified Boeing 767. The KC-46A has slightly more capacity and range than the KC-135 but is significantly less on both scores than the KC-10s, which went into service in the 1980s. That plane, a modified DC-10, is becoming increasingly expensive to repair and operate. Now, Stefanek said, the Air Force considers the KC-46A as a replacement to both older tankers. Once it has enough new tankers to reach the increased fleet level of 479, it expects to replace some KC-10s as well as some KC-135s on a one-for-one basis. The Air Force has only 59 of the KC-10s, divided between Travis Air Force Base in Fairfield, California, and McGuire Air Force Base near Trenton, New Jersey. Communities surrounding both bases were alarmed in 2013 when the Air Force proposed scrapping the entire KC-10 fleet if Congress went through with automatic budget cuts that would have been required under sequestration. Those cuts were canceled when Congress reached a budget deal, but a Fairfield group that supports Travis, much the way Greater Spokane Incorporated supports Fairchild, has been pushing its congressional delegation to bring some of the new tankers to that central California base. Travis is currently on the list being considered for MOB4. Murray said the Air Force has yet to come up with a clear explanation of how or why it would retire the newer KC-10s without a plane to replace it. “They don’t have one that they’re looking at,” she said. The decision on where to base the planes is ultimately up to the Air Force, McMorris Rodgers said. But a decision to retire an existing plane or replace it with a new one depends on the budget, and that’s up to Congress, she said. Plans to retire some KC-10s are so far down the road that they don’t show up in the fiscal 2017 budget, Stefanek said. They would appear in what the military calls “force structure changes” in a future request, and it will be up to Congress to provide the money for those changes. Published: April 26, 2016, 6:26 p.m.